Julianna Harte, the daughter of a reformed jewel thief, sneaks into the bedroom of Alasdair Sharpe intent on stealing an invaluable pearl, which will help her save her home for foundlings. 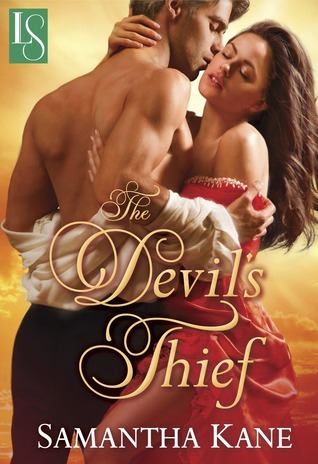 When Alasdaire catches her in the act, he strikes a deal that will forever change both of their lives. Julianna is a fun and delightful character, even though she's fairly unconventional for the era because of her strange upbringing. Her inner dialogue was fresh and entertaining, as was most of the writing in this story. Julianna's love affair with Alasdair was seductive and steamy, though curiously, their first encounter was a abbreviated for some reason. I thought that might be made clearer by the end of the book but I'm still puzzled by that, especially after one really HOT scene in a library. Alasdaire was appealing but I never quite figured out exactly who he was beyond having a very active love life before Julianna. His friends, Hilary St. John and Roger Templeton, seemed the more interesting and clever members of the 'Saint's Devils,' a moniker created when they were in college for their group of rogues. I liked him with Julianna but he was otherwise unremarkable. While Julianna's reason for stealing the pearl and attempting to later sell it made for some excitement, that premise broke down later in the story, leaving it pretty flat and implausible in the end. But, it did lead to another interesting character named Wiley and I'm counting on seeing more of him in the series. This was a very enjoyable story with a refreshing heroine who wasn't always making the best of decisions but that seemed in keeping with the character. The series shows promise as the other members of the Saint's Devils have already captured my interest. I'm rating it 3.5 stars and recommend it to those who enjoy interesting characters and steamy romances.